The continuing search by evangelical leaders for a Republican presidential candidate they can believe in took an intriguing turn this week when a handful of evangelical notables started to lean more publicly  and more urgently  in the direction of former Massachusetts Governor Mitt Romney. The latest move came on Thursday when Mark DeMoss, a well-known publicist for a variety of religious or conservative groups and causes, sent a five-page letter to friends and colleagues explaining that he had decided to back Romney, a Mormon. "As a Southern Baptist evangelical and political conservative, I am convinced I have more in common with most Mormons than I do with a liberal Southern Baptist, Methodist, Roman Catholic or a liberal from any other denomination or faith group. The question shouldn't be, 'Could I vote for a Mormon?' but, 'Could I vote for this Mormon?' After all, Mitt told me there are Mormons he couldn't vote for (I presume Harry Reid, for example); and there are Southern Baptists I couldn't vote for (Jimmy Carter, Bill Clinton, Al Gore, to name a few)." DeMoss, an unpaid adviser to the Romney campaign who worked for years for the late Rev. Jerry Falwell, and actually arranged a meeting between Romney, Falwell and other evangelical leaders last year, added, "I fully recognize some evangelicals take issue with me for supporting a Mormon for the office of President, and I respect their concerns. Indeed, I had to deal with the same concerns in my own heart before offering to help Gov. Romney. But I concluded that I am more concerned that a candidate shares my values than he shares my theology." DeMoss's endorsement come a few weeks after a group of more than 40 social conservative leaders gathered in Salt Lake City and agreed they might bolt the Republican party if the G.O.P. handed former New York Mayor Rudy Giuliani the Republican nomination. The group agreed that Giuliani's more moderate views on abortion, gay rights and stem cells made him unacceptable to social conservatives. Demoss's memo was just the latest effort in the system-wide Stop Rudy At All Costs campaign among social conservatives, who will host all the major candidates at the Values Voter Summit in Washington the weekend of October 19. On the same day that DeMoss made his views widely known about Romney, two other social conservatives, Gary Bauer, president of American Values, and Tony Perkins, president of the Family Research Council, met with reporters in Washington and made some positive comments about the Massachusetts governor  and less positive ones about former Arkansas Governor Mike Huckabee, the social conservative some had believed could attract grassroots support. The problem, however, continues to be a lack of consensus about Plan B. Focus on the Family's James Dobson did his best to knock off Fred Thompson as the least bad alternative to Rudy, in an e-mail to supporters that cited Thompson's lackluster rhetorical skills and questionable ideological commitment. But the real gauntlet DeMoss was throwing down was against the purists who favor an evangelical true believer like Sam Brownback or Huckabee or a Third Party Candidate To Be Named Later. The Romney apostles understand that any successful G.O.P. nominee will have to unite all the ornery wings of the party. With that in mind, they cite not only Romney's strong family values and faithful recitation of the conservative gospel  no new taxes, no gay marriage, no abortion. But also, in an appeal to the business and technocrat wings of the party, they point to his record as founder and CEO of Bain Capital, his management of the Salt Lake City Olympics and track record as a turnaround artist. "That kind of experience," DeMoss wrote, "convinces me Mitt Romney could lead, manage and govern America during a critical time in world history." 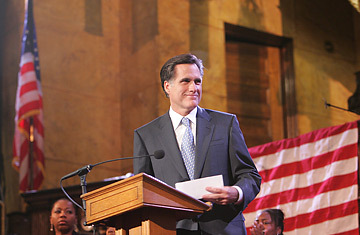 It is too soon to know if most of the nation's 50 million evangelicals will take the cue and give Romney a closer look. But the evangelical voters are one of the few real prizes in the Republican primary campaign  and one that Romney, who has stumbled a bit of late and trails both Giuliani and Thompson in many polls, could sorely use. All of which means we will be seeing more testimonials, endorsements, and solicitations designed to woo a voting block that has yet to find a hero as the primaries approach.